“College and career ready means that students graduate from high school prepared to enter and succeed in postsecondary opportunities—whether college or career—without need for remediation. Students should graduate fully prepared to pursue the college and career options of their choice. College ready refers to the full range of programs leading to valuable, recognized degrees, including community colleges and four-year colleges. Career ready refers to employment opportunities with meaningful opportunities for advancement as well as career training programs that offer technical certification or other marketable skills. Evidence and experience indicate that the knowledge and skills needed to succeed in college and career are greatly similar, and that all graduates will need some form of postsecondary education or training to succeed during their careers. To be college and career ready, students must graduate with the knowledge, skills and dispositions necessary to succeed. These are the kinds of deeper learning outcomes that are at the heart of being college and career ready. Knowledge, skills and dispositions are mutually reinforcing, and not contradictory. That is, evidence and experience confirm that education that advances application of knowledge through skills is more likely to result in student competency of the underlying, rigorous content knowledge. The knowledge, skills and dispositions have concrete meaning and can be expressly taught, learned, and measured. This will require multiple, robust measures or evaluation and assessment. 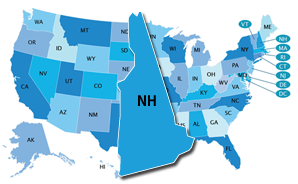 New Hampshire does not have a state policy in place that allows students to earn dual credit (ECS, 2015). New Hampshire is not participating in the Early College High School Initiative (ECHSI). More information about schools participating in ECHSI is available at the ECHSI website (Jobs for the Future, n.d.). New Hampshire has adopted the National Career Clusters Framework and is implementing all of the 16 Career Clusters. New Hampshire does not have a statewide system for career exploration or career plans at the K–12 level. New Hampshire may have a state-specific Early Warning System, but the system is not publicly available.